Keeper of the Cauldron. : Fire Fighting after FiRe - How to Manage an Emergency Fund when the Salary Stops. Fire Fighting after FiRe - How to Manage an Emergency Fund when the Salary Stops. 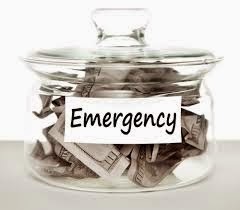 The standard advice about a emergency fund is that it should contain 3 to 6 months' worth of expenses (or even more - for a heated debate on this take a look at this recent MSE thread). The reason given for needing to keep this amount of cash is "what if you lose your job?" However, by definition, this can't happen in retirement (although there are many flavours to FI, some of which will involve earning an income of some kind). At this point we need to rethink our calculation and reassess our actual requirements. Will we need an "emergency fund" at all when we are drawing a pension or living on savings/investments? If we do need one how should we assess how much we need to keep in it, and, crucially, how do we top it up when it gets depleted. Our emergencies are most likely car, white good or kid related. I do not count holidays as an emergency (although taking one sometimes is :-) - probably not so much the case when you retire). Holidays, despite being paid for in chunks of cash, will continue be paid for by credit card when we retire and have been accounted for as part of our day to day expenses. Thinking about what has happened in the past and when we have unexpectedly needed cash it has generally been to make loans to the kids (some paid back, some not) for things like clearing student overdrafts, help with rent deposits and prop-ups so that they could complete their education. We have not (as yet) joined the growing number of parents who have helped their kids with buying a house but several of my friends have. If we do go down this route though it won't be an emergency. So, in the past the kind of figure we would be looking at that we might need at short notice could be up to around £3,000. In certain situations this could happen maybe 3 times a year - major car repair, fridge and telly both pack-up and the dog needs an operation. This semi-educated guesswork gives me a figure for our own particular emergency fund of £12,000 going forward. I'm happy with that, it can continue to sit in our "high" interest Santander 123 account and hopefully seldom get touched. But that's not the whole picture. In addition to this I do have to look at the bits of our income post retirement that aren't guaranteed. From when I retire at 58 and until I'm 66 and my state pension kicks in not all our required income will be coming from guaranteed sources. We will be relying on our rental income and dividends from our ISAs to make up between 30% (58 to 60) and 15% (60 to 66) of our £30,000 income. Neither of these sources are sure-fire or inflation linked. They are liable to fluctuate and may not always be available, or we may not always want to take them. In the case of the rental income we may have an extended void period or large repairs that eat into the rent. (I do only ever assess the annual income from the flat on 10 months' worth of rent but I want to be super careful here). In the case of the ISA dividends we might want to take advantage of a market drop to plough them back in and buy when things are cheap, rather than depleting the funds when they are low. In these situations extra cash in the emergency fund might come in handy. Given that between £4,500 and £9,000 of our income over those 8 years is not entirely secure, it probably makes sense to have at least a years' worth of the average required (£6,750) available in the emergency fund. This should be added to my original £12,000 and can all be fitted into the Santander 123 giving a total emergency fund of £19,000. So, I have my figure, we need a £19,000 cash emergency fund until I am 66 when it can probably be run down slightly. Getting the cash into the fund is doable - we currently have just under £14,000 as we've just used some cash to change the car. Making up the extra £5,000 won't be a problem over the next few months before my husband retires. The question that bothers me is how to keep it topped up once we have both retired and are maxing out our income. The whole point of the fund is that it will get used - although it would be nice if it didn't - so how do we fill it back up to comfort level when it does? Check ISA for any funds that are showing signs of good growth (this is independent of any ongoing asset rebalancing that is going on). If everything in the ISA is showing red do nothing, wait but rebalance ISA annually as usual if necessary. Wait. Wait. Hope emergency fund holds out despite deciding to use cash from it instead of taking dividends out of the ISA during the bad patch. Wait. Breathe sigh of relief as markets start to rise again. Wait for strong growth and eventually take some profit and rebuild the emergency fund. Weddings cost the earth: do you have daughters? Can you encourage them to elope? House maintenance is pricey when you are too old and bent to do it yourself; so is decorating. Eventually you may need to hire someone to help with cleaning or digging. I'll grant you that those are scarcely emergencies though. They are, rather, what? Unforeseen outgoings? You may need to pay for physio, or an osteopath, or a chiropodist. Old age is not for wimps. As for Santander: the present availability of current accounts paying interest above the rate of RPI inflation is an opportunity too good to be missed. It'll be particularly attractive if we are all allowed £1000 p.a. of interest free of tax from next year, as Osborne intended. But I doubt that he'll remain in charge, and Lord knows what our next Chancellor will want. Be he Balls or Salmond. Our car is twenty years old. Every MOT is potentially a financial emergency, so I'm going to cash in an Index-Linked Savings Certificate (ns&i) and hold the money at Santander instead, so that it is immediately available. It's a pity, the darn things are irreplaceable, but there you go. "Decumulating" they call it. "maybe sons' weddings are just as expensive these days?" Aye, but they're not a charge on you. Not needing a large emergency fund is something I had not considered before, so thanks for pointing this out. I will be working on the basis of being able to "earn" more money than I require and this would be used to either replenish an emergency fund, or to invest in shares in an ISA if my emergency fund has enough in it (following your article I need to review how large this fund needs to be). If I can do this my investment portfolio could continue to grow, and produce ever more income. This ideal scenario would then allow us to leave cash to a philanthropic cause when we do go to that great stock market in the sky. Hi. I'm not sure how you intend to "earn" in retirement - can you explain please? Is it via investments or will you be doing some actual "work". Leaving to charity is a fantastic aim. Do you have any favourite ones? Surely this depends on how much of your 30k is for the wants and needs? Just like when you were/are at work. Say your running costs are 15k. You need that to keep the roof over your head, Jack Frost at bay and the Council Tax repo-man off your back. Arguably a car is not essential for a retired couple - it's not a tool you need in order to earn your living unlike the working you. You now have the capacity to eat £15k worth of emergency a year, from income. Yep, at the extreme end you're now in lockdown mode, but it does work - I did three years of that while working icing all unnecessary spend in order to focus on FI. It's not fun, though probably a lot less bad as a retiree that as a wage slave. In lockdown mode while working you still have the daily slings and arrows of the working day but no expensive holidays and grande lattes to make yourself feel better. As a retiree you can go walk in the woods or read library books for low-cost entertainment, or indeed watch Made in Chelsea if you have the one-eyed monster on your wall. Your emergency fund needs to be your worst case estimate of what you need over and above that - well, maybe leave yourselves 3k wiggle room anyway. It's nice to have the odd latte. I'd say your BTL rental and your own house are the worst risk liabilities there, though you insure for the rare calamities you can't afford like fire. Your son's air fare and any daughters' weddings are foreseeable expenses. You save for things like that out of income even as a retiree. Likewise cars and white goods have an estimable service life (say 10 years though most folk seem to do worse). You know what they cost, in practice there is deflation in this sort of thing, save 1/10 the total capital cost of your white goods every year. It's not really an emergency, it's depreciation, but if you want to save in your emergency fund to amortize depreciation so be it. The replenishment period of your emergency fund needs to be long enough so that if it gets hit on a market high that crashes the next day, it can carry you (plus your savings from income help) for about three years which seems to be a reasonable guesstimate for bear markets to recover to fair value. If we turn Japanese then saving from income to refill the bucket is the best you can do. An emergency fund isn't there to insure you against emergencies - it's there to make them more manageable IMO by smoothing out the suckout until you can come up for air. You have control over your spending, at least in the wants department. Unless you're very rich you will need some of that control. Well, hello ermine - great to hear from you and I have just, before seeing this, commented on your blog about missing you (In a PF kind of way :-)). I will read and digest your comment properly and then reply. Once again, good to hear from you. Of course you're quite right. I tend to treat that £30,000 figure as if it's a set-in-stone commitment rather than a perfectly manageable set of needs and wants - with a very large part of it being wants. I think the reason for this is that I made a promise to myself that I wouldn't retire until I could "guarantee" our current lifestyle. My husband has worked until he is 62 so that we can find ourselves where we are now, so I don't really want to "pull down" our quality of life by going sooner than he did. But even writing that sentence I realise that I have got myself into a bit of a shoddy mindset with this as "quality" of life is not dependent on having a fixed amount of income, especially when all the needs are covered. Maybe I need to take another look at our budget, reassure myself by working out what we would actually need of that £30,000 and how much could be saved or used for emergencies where and when necessary, and stop worrying so much. I think one of the major advantages the retiree has on the wage slave is flexibility, because they own their own time. That flexibility rolls a lot of ways - you can spend tie doing some things to save money, or the other way round. Likewise rolling with the slings and arrows of the business cycle, using some of that flexibility to spend less when markets are down and more when they are up is one way. Look at ti another way - to underwrite a fixed amount of wants spending means you have to save more, which probably means spending more time at work. That has a different sort of cost - you only have so much time available to you. There's no right answer, but I'd be surprised if working longer to achieve a fixed spending capacity wins hands down as opposed to being somewhere on the sliding scale of variable spending/flexibility. I think once you no longer have a regular 'wage', an emergency fund is a very important buffer but as Ermine says, perhaps the £30k figure you have come up with needs to be reviewed as I think it could be on the high side. Occasionally, I've taken a 'loan' from the rent I get from my BTL, but this is always paid off straight away as I don't want to be caught short for any BTL type emergencies. My 'emergencies' right now could be related to (like you) car, white goods or house/garden. In a few months time, I'll have paid off my car and I intend to start a 'car maintenance fund' to help cover the likes of MOTs, repairs etc. Car repairs contributed to the debts I had in the past and I don't want to be caught in that area again. I've started putting a bit of money aside for Christmas presents, got the idea off M from There's Value. Hopefully this will help me avoid leaving debt on my credit card! Thanks - the £30,000 is actually our "target" income when we're both retired, I assess my EM at around £19,000 - conveniently just about filling the Santander 123. You're quite right though - I could probably look at reducing given ermine's comment. It's interesting that you mention post-Christmas credit card debt. Our credit card bills fluctuate wildly as we use them to pay for just about everything that we can't do by standing order/direct debit. (They can vary by as much as £1,200 from one month to the next). They are all paid off in full every month but given our lower income in retirement it might be a good idea to think about how to "smooth" the payments. I had not really thought about the actual emergency fund needs during retirement. It is a very good point. The actual need is diminished in some regards and perhaps slightly more predictable (though hardly). Moving capital gains into cash is an interesting idea. Of course, you still need to ensure that the dividend income is not too adversely affected. However, I presume you would plan to move the actual capital gains into cash and reinvest the original invested funds into higher yielding equities/ETFs to offset this? That would make sense. That is, say a £1000 investment with a current 3% yield was sitting at a £1500 profit. Sell it. Take the £500 and store it away as cash. Then reinvest the original £1000 invested in a 4% yielding equity or the like. Doesn't entirely offset the income but goes some way towards it. Does that make sense? Is that what you were thinking of? Well, more or less. I was actually thinking of selling off just enough to take out some profit and leaving the rest invested. Bearing in mind I only invest in funds, EFTs and ITs - no single companies. For example I recently sold off £500 worth of my Baillie Gifford Shin Nippon IT as it had made 27% profit leaving the original £2,000 I invested in there. This was part of a re-balance as I only really want 4% Japan in my ISA. I was thinking of doing the same kind of thing to skim of profits (hopefully :-)) to restock our cash EF. As part of that review I would certainly need to look at the dividend yield of our holdings as it's not something I've concentrated on so far as we are just ploughing everything back in. In that case your suggestion to review this when making a sale is very apt. Thanks. I see, that makes sense. Saves on a lot of fees that way over mine which I have just thought as well (easy to forget that)! I think it sounds pretty solid to just skim off your profits for the EF. It should give you plenty of opportunities to keep it topped up when appropriate. No, I suppose at this stage you would not have looked at the yield but it is something--once you're living off your income--that needs to be thought about! But you have time to work that one out! Do you have any sort of specific plan currently? A plan to have a plan. If only everyone could say the same thing the world would be much improved! We invest in low-yielding or no-yielding stuff in our SIPPS, and high-yielding in our ISAs and, at present, current accounts. I suppose that's the tax-efficient way to do things? Food for thought. Tough question. My thoughts would be that with low inflation currently and the new rules on tax free savings at least a fair chunk in easy access cash savings isn't being battered away to nothing. With Santander, TSB, Nationwide accounts there are plenty paying 3%+. Like Ermine said, the emergency fund could be used during a market depression whilst awaiting for the recovery, so maybe £30k would give you this cover? Hi Mr Z , the £30,000 is target income, but as ermine says, trying to guarantee it might be giving myself a harder job than necessary when a more flexible sliding scale would do. That would take the pressure off the EF too. I can remember two panics in the 70s: bog rolls and sugar. Neither, as far as I know, had any basis in fact or logic, but a "run" on any product can become self-sustaining. The lesson I draw is that you can't list all the possible emergencies to which you might be susceptible, though there's no harm listing a few as long as you don't assume your list to be comprehensive. So against emergencies you might like to stockpile not only money, in the sense of bank accounts, but cash - in the sense of fivers, tenners and a few gold sovs - kitchen foil, bog rolls, and tinned food. I'm not advocating being a "prepper" and stocking half a lifetime's worth plus a few machine guns, but enough to see you through a bit of supply-chain disruption. Spending a few hundred pounds in this direction might be fruitful, though you have to hope that such stuff will never be needed. I recall that 1970s bog rolls thing too, though in London they really weren't to be had for a short while. Something that was news to me was that nowadays even tinned food has a relatively short service life - about five years or so. I had, ahem, stockpiled some around 2000 - when it came to investigating the back of that cupboard in 2007 a significant number of those tins were somewhat distended and ready to blow. So rotate things like that. I had assumed tinned food lasts pretty much for ever before then! From my files, a piece by John Norstad that I've dated 14/1/14. Portfolio performance (US I assume) over a thirty year retirement is calculated assuming a drawdown of 3% p.a. ; his simulations show that you'd have a 98% chance of not emptying your pot. "All the optimal portfolios contain AT LEAST 20% cash, at least 20% stocks [i.e. equities] and at most 40% bonds". No doubt the cash is there so that you don't need to sell equities or bonds when they have crashed. That 20% cash is not exactly an emergency fund, but it shares some of its nature: it helps you cope with undesirable and unpredictable events. Here he is: ain't google wonderful? Many thanks for the link :-) - one to take a little time over. I am presuming you have your mortgage paid off? If so £30K sounds like it has a lot of wiggle room as others have said. If you are both spending £30K on the nose whilst working I am sure you will end up spending less in retirement as all those work expenses go out the window! Interesting topic. I was a bit surprised at your focus on things like replacing the fridge or helping adult children when I'd have thought by far the biggest risk than you'd need an emergency fund for would be the BTL. If your own possessions fall into disrepair, then in extremis you can just put up with that, and adult children can be encouraged to do what's needed to put together their own emergency funds, but BTL emergencies are no-one's responsibility but yours and have to be dealt with immediately and well, however expensive. In the past with my own BTL I've had to fund 2x roof repairs, a new boiler, expensive work on sash windows, and an unexpectedly long void all occcurring within one 24 month period ..... so fairly large and liquid buffers might be advisable. Some 'professional' landlords (i.e. those with large portfolios) hold 20% of their property value in cash as an EF. Otherwise I largely second Ermine's points. I expect to 'retire' within the next 4 years and am building into my projection of how much I'll need per annum an amount equivalent to 1% of my home's value to cover things like maintenance and replacement of white goods etc, and I'll begin with a fund of 3-5 times that annual amount (which will protect me in case of unforeseeable expenses in the first few years). My annual budget will also include a chunk of money to go towards replacing the car (as Ermine suggests too). That's a very good point Skinflint. Fortunately the flat is very small with not much that can go wrong - apart from washing machine, fridge etc. We replaced the boiler last year so hopefully that will last for a while now. It's also a leasehold so the building is looked after by a management company. Void periods could happen of course but I only assess our income on 10 months rent anyway so we do have a bit of built in slack there. Nevertheless I do need to make sure we have an extra chunk in the EF to cover it. Many thanks. We are going to ‘retire’ this Xmas at 49/48 years old on £24K annually and have no emergency fund at all! Our funds to last to 55 are 70% Cash 20% Bonds and 10% Tracker Index funds, so we don’t have much investment risk during this phase of early retirement and we still have a ‘one account’ mortgage currently with a zero balance that we can borrow against if needed. At 55 there is enough fat in our SIPP’s to withdraw a 60K cash emergency fund and increase our income to £30K. The emergency fund at 55 is key to provide a buffer in market downturn as we will then be living off our SIPP investments untill 67 by which time we will have sufficient defined benefits and state pension to replace the SIPP income. Ultimately our emergency fund is to return to work or downsize our house. That sounds like a very well thought through plan so I guess that you know that you can live as you would like on £24,000. Keeping the mortgage option for emergency borrowing purposes seems a good idea - which could then be paid back once you can access the SIPP - and of course downsizing is an option if absolutely necessary. Good luck and congratulations on an amazing job of getting to FI so young!